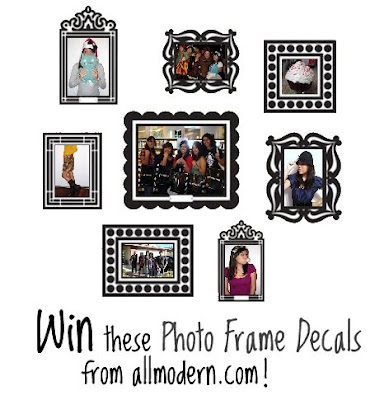 my lovely sponsor for this giveaway, allmodern.com, has been super generous to offer one of my lucky readers these awesome photo frame decals by BUTCH & Harold! i picked them out myself (i'm a sucker for anything with black filigree and art deco patterns) and thought you guys might like them as well. the set (valued at $19.95) comes with 8 super cute removable frames that you can stick on the walls to hold up all your favorite photos! how cool is that?? be sure to check out their other site for a great selection of living room furniture. 1. simply leave a comment in this post. please leave your e-mail address so i can contact you if you're the winner. 2. additional entry on twitter: tweet about the giveaway. include a link to my blog (http://sweetsandhearts.blogspot.com) and be sure to mention my twitter username so i can find it easily (@iamericaleigh). 3. giveaway ends sunday, january 10th at 9 pm pacific standard time. a winner will be picked randomly using random.org, notified by e-mail, and announced in a future post.